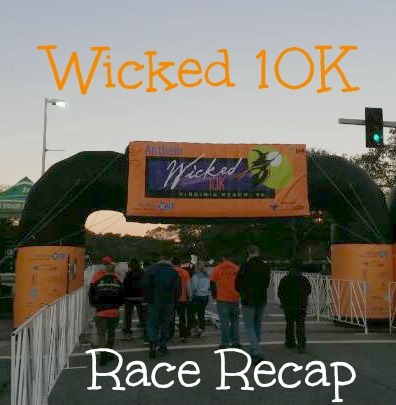 Fairytales and Fitness: It's the Wicked! I am probably the worse to give any advice because I never follow any plans but if I would say one it'd probably be run more often. The more you run the more your body acclimates to it. I hear incorporating speed work helps too but I usually never do, but probably should. Sounds like fun! 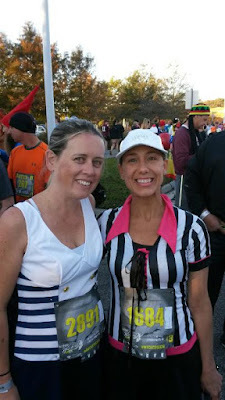 How great that you ran with your friend at her pace! I was just happy to have someone to run with. This sounds like such a fun race! That's great that you ran it with your friend and had matching costumes :) It's impressive that she's got such an extensive costume collection. I'm impressed you were able to eat that Krispy Kreme during the race too! I know I can always find one in her box. It helps that we are about the same size. Yums! donuts on the run! that sounds delicious! sounds like an awesome race! Yay for free costumes! I too have difficulty with the idea of paying lots of money for a Halloween costume. I've been pulling out the same black cat ears and tail since I bought them back in college. Oh I have them too, but I thought this time was time to finally switch it up. I'm sure your friend appreciated you sticking with her more than you realize - it's hard when a side stitch happens to recover and get running again, but with you there, she got through it and sounds like it was a great finish! Yes she did. Good thing it didn't affect her long. that sounds like a great race! I love all the costumes it's fun to take it light hearted sometimes isn't it?! It's always fun to dress up for festive races. Did those two in the bed RUN in that thing??!?!!? Yes. There legs were out in the back, so basically it was just the bed that was in front of them. This sounds like a fun race & a great after party! I agree that I'm usually too tired after races to enjoy the post race celebrations so it's nice that you were able to this time. It drives me crazy too when people say "almost there" when you are clearly NOT almost there. I know! That is a pet peeve of mine! What fun!! Super cool for your friend to have the morning off from kids to do something good for her soul! I'm sure she appreciated her husband for taking over the parent duties that morning. Awww I love this :) Your costumes are super cute! 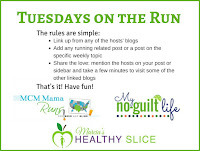 I am chuckling picturing you eating a donut lol but i bet it felt fun to run and relax. It is nice you hung out and enjoyed the festivities..the food and beer sound great. It was only a piece, don't know if I could down a whole donut even if I was running it just for fun. Sounds like a fun run!!! I wish I had a running buddy sometimes!! It is nice to have! This sounds like a really fun race! 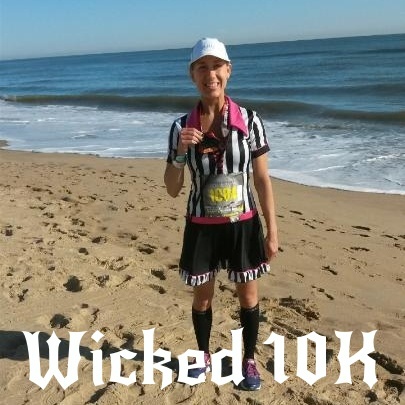 Congrats to your friend on her first 10K! It was so nice of you to run with her - I agree, a fun run is no fun alone! What a fun race! Races with friends are the best! Cute costume! I love Halloween races because they're just fun. I did one 4 years ago, and it was so much fun seeing all the kids in costume and guessing what they were. Sometimes I feel like if I have to guess what they are, they didn't do a good job...haha. But now I don't know much of what little kids are into these days so that could be one of the reasons too. Lacey, I love your outfit!!! It is super cute!!! The Wicked race sounds like it was an amazing time and how cool that you got to enjoy the entire course and all of the post-race festivities with your friend. It means a lot to a newer runner to have someone there at their side to motivate them!!! Very cool that they served tomato basil soup at the post-race party, that would be a wonderful treat! I would totally have taken the Krispy Kreme, too. =D YUMMY! 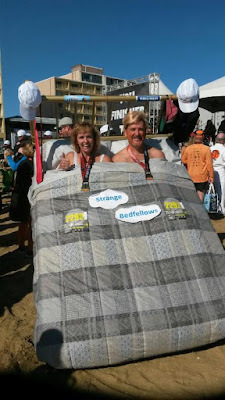 I think it's so wonderful that you ran with your friend during this one - I'm sure it made for a fun race for you both. And lol about the donut - I also would have grabbed one if not racing! 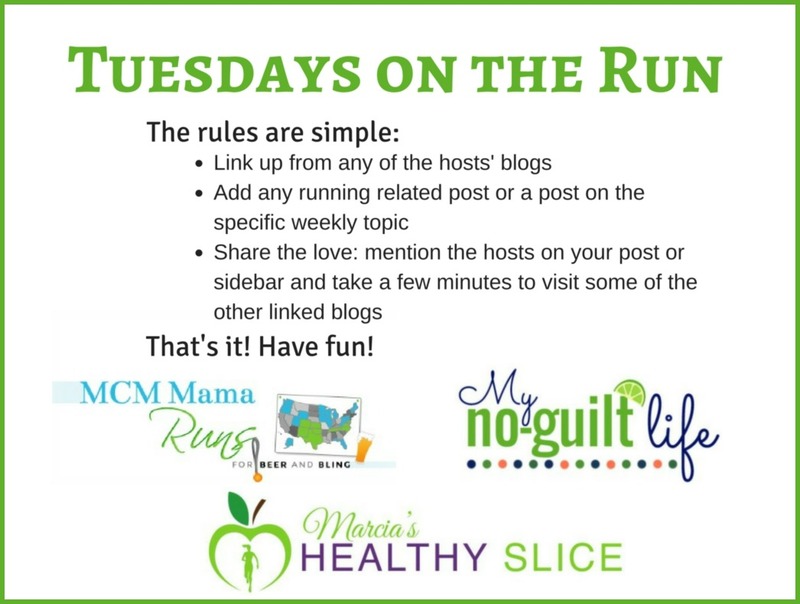 Sounds like a really fun run... how nice to run it for fun and help out your friend! And the weather was perfect which made it very nice! Sounds like a fun race! I'm sure your friend really appreciated your sticking with her - side stitches can be no fun! I think we have all been there at one point. How can you hate candy corn??? :) That sounds like a great race. I love themed races so much! 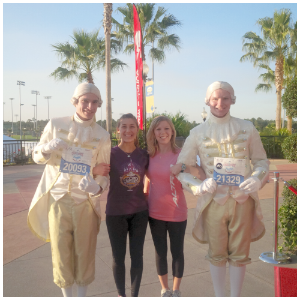 Sometimes it's nice to run for fun, (oh hey there, runDisney). Sounds like a fun race. J&A seems to have a good reputation. I bet your friend really appreciated your encouragement! Yes they do! 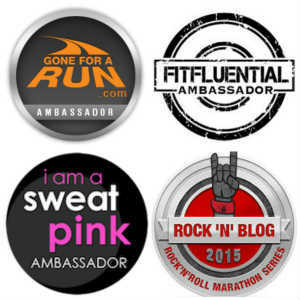 I am debating to sign up for another one this month. I really don't want to spend the money, but I don't want to miss out either. Sounds like a great race and a nice after party too. I want to know how did the people in the bed run? It must have been really difficult and I wonder if they did any practice runs. Wouldn't it be funny bumping into someone dressed like that during your normal morning run?! It was good that you had someone to run with but I'm with your friend, i can just about drink and run, let along eat a doughnut. Give me all the doughnuts aretreads and id be happy! I'm sure it was more of a shuffle than a run. They did have the back open so there legs were free. I love running first races with people!! Even if I don't do well, there's so much joy and excitement in it! Of course, you did VERY well; congratulations! That looked like a good one! So glad you were able to provide some support to your friend for her first 10K. I'm sure that meant the world to her. That costume, tho! LOL! Who can run like that?! Congrats on the run!